How Much Do Dental Implants in Lynnfield Cost? From groceries to gas prices, cost is a factor in most of the choices you make — and when it comes to tooth replacement, your options may appear to vary dramatically price-wise. Dental implants can seem to be far more expensive, but over time they often end up being the better investment. How much do dental implants in Lynnfield cost, exactly? It depends on a few factors, including how healthy your jawbone is, how many implants need to be placed, and their location in the jaw. Dental implants need a sturdy, healthy jawbone to successfully anchor in the mouth. 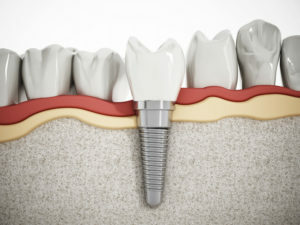 If your teeth have been missing for several months, if you have had periodontal disease, or if you have a weaker jaw to begin with, you may need to have a bone augmentation procedure before you can get dental implants. Adding on an extra procedure equals more money for your total dental implant procedure. A bone graft or sinus lift creates more volume in the jaw for the dental implants to anchor to. Sometimes the dental implants can be placed right after the bone graft procedure, but you will usually have to have a recovery period while the bone heals. The cost of your dental implant treatment is also dependent on how many implant posts you need to have placed — whether it’s a single tooth implant or many implants. In cases of significant tooth loss, you will not need to have an individual post for each missing tooth. A complete denture can be retained using as few as 4 strategically-placed dental implants. This is usually the greatest factor influencing cost. Your back teeth are very different from the front ones, so it should make sense why the location of your missing teeth impacts the cost. Molars and premolars may cost less to replace with dental implants simply because aesthetics are not as much of a concern as when the front teeth have gone missing. Teeth restored with implant-retained porcelain crowns look, act, and feel just like your natural teeth. It depends! The cost of dental implant procedures varies from person to person. The only way you can find out for sure what your dental implant(s) will cost you is to visit a trusted implant dentist in your area. Whatever the cost, dental implants are usually the best financial investment you can make for your smile. They offer a number of benefits that non implant-retained options just can’t match — like durability, a stabilized jawbone, and improved oral and overall health over a lifetime. So now that you’re armed with the facts you need on what could impact the cost of your dental implants, don’t wait to reach out to your dentist to get started! Dr. Rob Schumacher has been providing excellence in implant dentistry for the Lynnfield area for over 14 years. To learn more about your candidacy for dental implants or how much your procedure may cost, please contact the office at 800-523-2427. Comments Off on How Much Do Dental Implants in Lynnfield Cost?